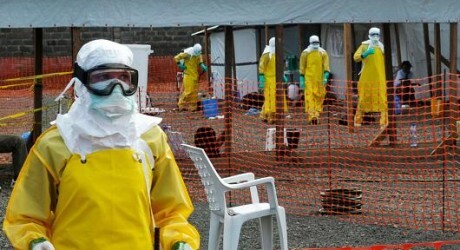 The World Health Organization denied Monday that politics swayed the decision to declare an international emergency over the spread of the Ebola virus last year, despite evidence senior staffers repeatedly discussed the diplomatic and economic fallout of such a move. A year after WHO declared that Ebola had been found in Guinea, the agency is on the defensive over reports that it dragged its feet when raising the international alarm over the disease. Internal communications published by The Associated Press last week documented senior agency staff discouraging the move about two months before the international alert was finally raised, citing diplomatic relations, mining interests and the Muslim pilgrimage to Mecca. WHO spokeswoman Dr Margaret Harris said Monday that “political considerations did not play a role” and that notions to the contrary were due to a misinterpretation of the leaked documents. Harris did not respond to follow-up questions about how the documents should have been interpreted. An international emergency was eventually declared on Aug. 8, by which point nearly 1 000 people had died. Ebola was judged to have become a health emergency with international implications nearly a month earlier by the US Center for Disease Prevention and Control. “I activated the emergency operations centre at the CDC on July 9,” said Dr Tom Frieden, CDC director, meaning the agency moved immediately to put the organisation’s full weight behind efforts to curb Ebola in mid-July. Frieden said WHO’s international emergency declaration should have been based mainly on health criteria. “We need to ensure the technical issues are always the primary issues that lead to the decisions that are made,” he said. WHO argues that an emergency – the equivalent of a global SOS – wasn’t needed despite criteria which suggest one is warranted when there’s a high risk that the disease will jump to another country and spark a new outbreak there. Recently drafted internal talking points seen by AP say West Africa’s borders are so porous that it didn’t make sense to declare an emergency despite the fact that the virus was causing an epidemic across three countries by early 2014. “What we needed to see before declaring (an international emergency) was whether other countries that did not have this continuous cross-border movement were at risk,” the talking points state. Harris, the spokeswoman, said that only happened in July when a Liberian passenger sick with the virus arrived in Nigeria. “I find that a very strange argument because to consider that an epidemic that had taken hold in three different countries was not an international epidemic … (it) doesn’t make sense,” said Christopher Stokes, general director of Doctors Without Borders, which published a report on the outbreak Monday. In its talking points, WHO tries to draw a distinction between declaring a global emergency and responding to the crisis, arguing that it mounted “a strong operational response” last year. But that is disputed by several people who witnessed WHO’s response on the ground. Many defenders of WHO, including senior people within the agency, say the organisation just isn’t cut out for hands-on work in the field.